Last night after the Trick-or-Treat, we proclaimed Halloween is over in our end. Although, there were still few adults outside asking for candy even if the Trick-or-Treat curfew is over. But they never ring our door bell because we already turned the lights off which was a signal that no more candy and trick-or-treat was over. Anyway, as I was going up and down the stairs i had this feeling that someone was staring at me. When i came down this spooky witch cover was the one peeking at our door. 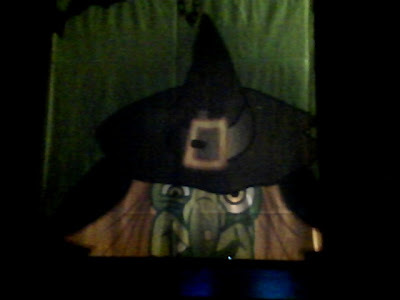 It was very spooky though, if I hadn't know that it's a door cover i would probably freaked out. My husband I thing got bothered with this witch so he removed the cover when he got home from work today. He was probably felt creepy when he got up this morning for work. Anyway, how was the Halloween and Trick-or-Treat at your end?